Our University, with a strong presence and reputation in the wider international scientific and academic community, has throughout its long journey of important work, remarkable results in international relations and partnerships with academic institutions abroad. The University has active cooperation with equal or equivalent universities & Higher Institutions in Europe, the Balkans and Black Sea countries, Russia, USA, Canada, Australia, Middle and Far East. The agreements relate to many disciplines, benefiting the scientific staff, students and the institutions participating in them. The Office also undertakes all necessary steps each year for the University of Piraeus to participate in international meetings (International Association of Universities, European Association of Universities, etc.) to inform and contribute in the decisions and actions relating to education and higher education in general. The presence of the University of Piraeus in international affairs is strengthened by the active participation in 5 international associations and organizations. 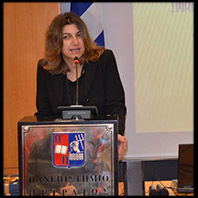 It is my pleasure to welcome you all to the University of Piraeus, one of the leading Academic Institutions in Greece. In our University, research, academic knowledge and practice are combined in order to create the most appropriate conditions for our students to reach their full potential and become the leaders of tomorrow. I wish you a fruitful stay in our country and in our University, full of life– changing and personality– shaping experience."